In a second post, we discussed that in response to the court’s dismissal of its original complaint, Forever 21 filed a massive, 145-page amended complaint, which appended over 100 pictured examples of products sold by other brands and retailers having similar designs. The filing highlighted the fact that trademark rights can be lost where a design is allowed to become commonplace and loses its association with a single brand. Forever 21’s amended complaint highlights an important point for trademark owners. As we discussed, a trademark is merely the right to use a particular word or symbol to identify the source of goods. It is only infringed when used in a way that confuses or deceives consumers. Consumer perception is thus paramount – what do consumers think when they see the mark on the trademark owner’s own product? Are they confused when they see a similar mark on the accused infringer’s product? Now, in its most recent decision, the federal district court in Los Angeles has allowed Forever 21 to proceed with this new complaint, since the detailed allegations, which at the early stage must be assumed true, more than sufficed to state a claim. 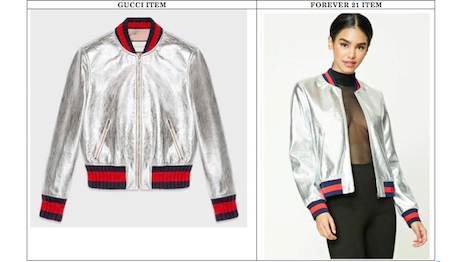 The court also made two important technical rulings: Forever 21 could also seek to cancel all Gucci registrations for the same designs, even those that did not list the types of goods that Gucci accused Forever 21 of infringing. 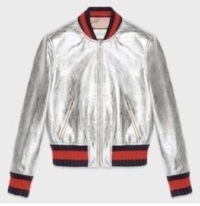 And, Forever 21 could also seek to deny Gucci new registrations for the same designs. Gucci is understandably frustrated that its decades-old trademarks are subject to challenge. But, this latest development again reiterates the points we made in our prior posts. As we noted, design trademarks require the trademark owner to show public association of the design with a single brand. Consumer perception can change over time – what once may have been viewed as exclusively “Gucci” designs may now be viewed as a commonplace design of many brands. That at least is what Forever 21 alleges and now must prove. Jacket cited in Forever 21’s amended complaint. Since consumer perception of exclusivity is the heart of the case, the lesson for trademark owners remains: “enforce it or lose it.” Trademark owners who wish to maintain their rights in their marks need to vigilantly police the market and make sure that their marks do not lose their source-identifying power through widespread use.